It's been a while since I have posted here, and I'm missing it a bit... I enjoy taking a look at what is going on in the city around me and looking for connections, possibilities, and opportunities for improvement. So I'm going to try a new format for a while - the Tuesday Morning roundup: Each Tuesday morning, stop in for development and urbanism-related news snippets, photos of interesting projects, and maybe a few bits of insight and/or snarkiness (depending on whether or not I have had my morning coffee). Speaking of morning coffee, I am excited to have my neighborhood coffee shop back when Mars Cafe reopens under new ownership on September 15! The meteoric rise of Mars Cafe was fueled by its great coffee, unique and fresh menu ("Solarz", anyone? ), engaging staff, and a hipster vibe just pretentious enough to draw in the Marks without offending the Benjamin Coffin IIIs. Though their website hasn't been updated to reflect the new plans, the Facebook page has been running teasers for weeks... Here's to a great new beginning! I have written before about the positive effect an established "third place" can have on the character and health of a neighborhood. Mars Cafe is just such a place for the Drake neighborhood. Look for me in my usual seat working once the crowds rushing back for the reopening have died down a bit. In other news, the Des Moines Rehabbers Club is set to submit its IRS 1023 form soon. For those of you (like most of us) who are not tax attorneys, the 1023 is an organization's application to become a recognized 501(c)(3) tax exempt non-pofit organization. 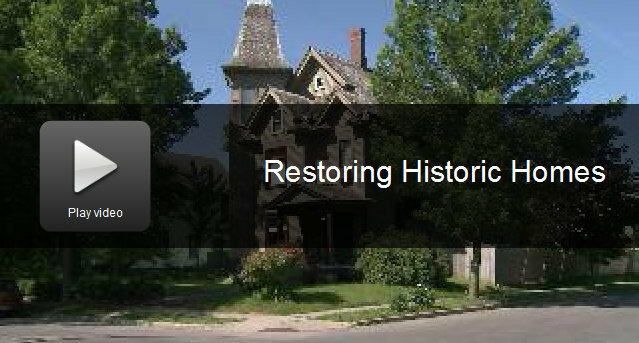 The Des Moines Rehabbers Club mission is to promote neighborhood revitalization and restoration of Des Moines' unique building stock by informing, educating, inspiring, and supporting each other in all phases of home renovation and maintenance. Look for this organization to re-energize its "Most Endangered" building list, host more events, and partner with other organizations working on similar issues. Our underlying goals is to facilitate revitalization in the City of Des Moines by helping people live in and love their older homes. Speaking of older homes, September 15 and 16 marks the 16th annual River Bend Home Tour. My friends, the signs are all there for this neighborhood to continue its rebirth: committed advocates, a strong neighborhood organization, fabulous building stock (ready for renovation), proximity to downtown and connection to the rest of the city, a diverse resident population, a newly established historic district, city investment. I've been in most of the homes on the tour this year and can tell you with little reservation that you don't want to miss this event! Forget everything you know about awesome historic homes elsewhere in Des Moines and get over to River Bend this weekend because there is a house with an underground tunnel (if they let you see it)... 'nuff said. Home Tours are not just a way for neighborhood organizations to make money. Particularly in older urban neighborhoods, house tours are a way for the neighborhood to re-introduce itself to the public. Despite the multitude of positive things happening in River Bend (and many other Des Moines neighborhoods including mine), our biggest battle when it comes to revitalization is often the inertia of a bad reputation. Home tours help neighborhoods reframe the message and manage public perception - to showcase the neighborhood's assets when sometimes it seems that the only news that escapes from the neighborhood is negative. Not only did he put together a great report, but he allowed us to tell a different story about renovation in historic neighborhoods: one of hard work and sweat, but also one of hope and potential (full disclosure: I'm in the story, too). My heroes are people who dive in to difficult neighborhoods head first: leading their neighborhood organizations forward, volunteering, applying for grants, fixing up their homes, helping their neighbors, sitting out on their porches at night, starting businesses, creating historic districts - they know it's not always a great "investment" but they do it out of a need to be a part of preserving the past and building a greater future. I have friends who do all of this while holding down a full time job! Please support the work they do by taking some time on September 15-16 to drop in and take a look at their neighborhood. Which reminds me. It's time for me to start my work... See you next Tuesday.